Despite a few decades of racket-busting, Scottish investigative reporter and author Andrew Jennings is still at it. He’s reported on a wide range of topics, but is most acclaimed for his investigations into the workings of the International Olympic Committee (IOC) and Fédération Internationale de Football Association (Fifa). Ahead of the World Cup, his latest salvo against Fifa is the e-book Omertà: Sepp Blatter’s FIFA Organised Crime Family, published by Transparency Books, which carries a foreword by Brazilian Congressman and 1994 World Cup winner Romário de Souza Faria. It comes at an opportune time; football-crazy Brazilians are protesting against the alleged corruption that has gone into their country hosting the World Cup, and even Fifa’s long-time sponsors have asked for an investigation to see whether bribery was involved in awarding the 2022 World Cup to Qatar. The e-book, released on 11 April, is available on www.amazon.in . How different is ‘Omertà’ from ‘FOUL! : The Secret World of Fifa; Bribes, Vote Rigging and Ticket Scandals’ and what prompted you to write it? I have been developing my analysis of Fifa for more than a decade. At first I thought it was just another investigation into a few rotten apples. Since publishing FOUL! in 2006, I realized that Blatter never criticized the bad guys in his leadership group. Eight out of 23 have been forced out in recent years but Blatter never condemns them. I went back to my time in the 1980s investigating the mafia in Palermo (Sicily) and began to see similarities. I write about this in the book. I looked again at the structures of Blatter’s Fifa and the simple buying of loyalty through secret distribution of World Cup tickets and unaudited “development grants". This is typical organized crime. I wrote this for academic journals with no response from Fifa. No answers, no comment—and no suing. I asked myself—what are the roots of this organized crime? I went to Rio (de Janeiro), home of former (Fifa) president João Havelange, talked with prosecutors and a judge and discovered Havelange’s links to Brazil’s crime boss. I think that what I discovered in Brazil is stunning—and explains why Fifa is a foul pit of corruption. Havelange (1974-98) and Blatter (1998 onwards) have presided over some of Fifa’s biggest scandals. What is the biggest scandal to have rocked Fifa in the past four decades? Havelange set up the rackets, especially the $100 million (around ₹ 600 crore now) marketing and TV contract kickbacks that I first revealed on BBC TV in November 2010. Blatter kept the machine running because it kept him in power. That is the first big scandal; the second is that the leadership group at Fifa are gangsters, not fallible people but members of a crime syndicate. Investigative reporters are used to making revelations and it is taking a few years to filter through. But it will. This analysis is accepted in Brazil where Havelange’s links to organized crime were well known. The brave men and women of Brazil who risk their lives against brutal police to reclaim their flawed democracy will be demonstrating against the World Cup corruption, as they did last year. Fans, press and politicians attack Blatter for Fifa’s corruption. They miss the point; it is that corruption—tickets and grants, plus a wonderful lifestyle—that keeps him in power. Some of Blatter’s executive committee members like Jack Warner and Mohamed bin Hammam have been forced out. Who’s next? I am a reporter—not a speculator. Why is Romário supporting your book? Romário learnt about the corruption of the bosses when he was a player. He became a politician and discovered my investigations. He appreciated my exposing the corruption of fellow Brazilians (Ricardo) Teixeira (the former president of the Brazilian Football Confederation was found guilty of corruption in the awarding of World Cup marketing rights) and Havelange, and is happy to give moral and vocal support to my work. We are blood brothers in the fight against corruption. He says that! 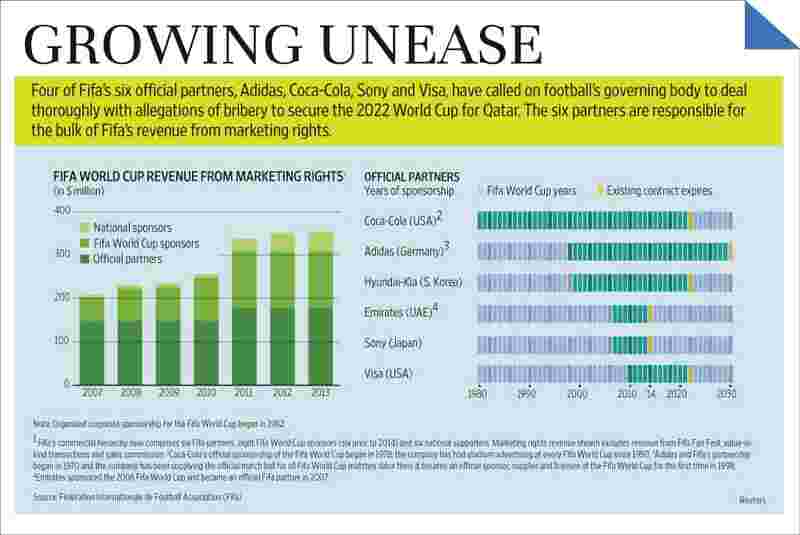 How come the super-rich Fifa hasn’t managed to “silence" you? It’s a simple answer. It is not about money—it is about truth. I research, find sources, and they give me documents. My lawyers approve everything I write and film. Blatter and his group can never go to court. The first question, “Herr Blatter, why do you refuse to disclose what Fifa pays you every year? ", would destroy him. So his people and their compliant sports reporters attack me—but never start legal action. I would always be happy to testify, as I have to the Council of Europe and the Brazilian senate.